Hutt Field was a roughly triangular field on the corner of Combe Street Lane and Mudford Road which bounded the field on its northern and eastern sides. To the west it abutted Combe Street (1092) and Stoney Field (1088). On the 1842 Tithe Map the words 'HUTT GATE' are written across the Mudford Road - Combe Street Lane / Stone Lane crossroads, being one of the town's early toll gates. The hut was shown in the field called Hutt Field (Parcel 1089) and was the toll keeper's 'hut' or house. The tollhouse was later demolished and rebuilt on the corner of Mudford Road and St Michael's Avenue. The map shows the field with a sub-division 1092 (not shown on my map below). This field was known as Beaconfield and was the occasional site of one of Yeovil's two Elizabethan signal fire beacons. The 1846 Tithe Apportionment recorded Hut Field as being 6a 2r 0p and noted that it was arable, that is, suited to the plow and for tillage and therefore used for producing crops. 1089a was not referred to in the Award. Today the former field known as Hutt Field is completely filled with housing of Combe Street Lane to the north, Mudford Road to the east and Combe Close to the west. 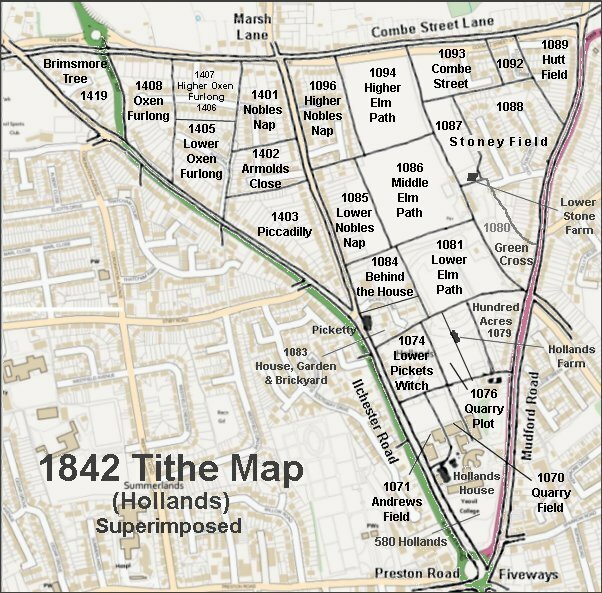 The Hollands area reproduced from the 1842 Tithe Map. Hutt Field is top right. 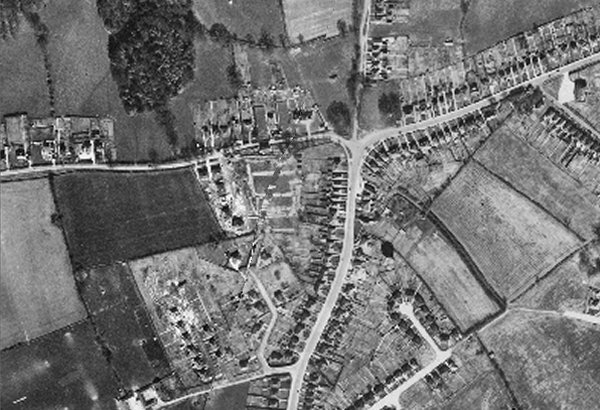 The 1946 aerial photograph showing Hutt Field at centre left with houses of Mudford Road occupying the eastern edge and Combe Close under construction in its north-western corner.